Mohiaddin Alwaye was born on 1st of June 1925, in the village of Veliyathunad near the city of Alwaye in the state of Kerala in the southern part of India. His father, Makkar Moulavi, was a religious scholar and an Imam known in the central parts of Kerala. Mohiaddin Alwaye received his basic religious education from his father, who also had several other students as per the system prevailing in those days. He later earned his ‘Moulavi Fadhil’ degree in Islamic studies from ‘Baqiath Salihath’ college in southern India. 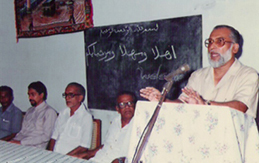 He next earned his ‘Afzul Ulema’ degree in Arabic and related topics from Madras university in 1949. He was immediately appointed as a teacher in ‘Rawdatul Uloom’ Arabic college near Kozhikode – Kerala. 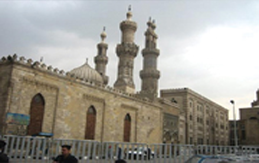 Due to his passion and desire to advance in Arabic and Islamic studies, he traveled to Egypt and joined the famous Al-Azhar university. He earned his ‘Alamia’ (equivalent to M.A.) from college of Usool El Deen (theology) in 1953. During his stay in Egypt he was very active in the literary field. He wrote in several magazines and was actively involved with the Islamic movement and participated in its activities and wrote in its publications. On his return to India, he join ‘All India Radio’s Arabic section in Delhi. continued during this period his cultural and literary activities. One of the areas of interest was researching and improving Indo-Arab relations. He wrote a lot on this subject, and has two important translation works in this field. After his marriage, he returned to Cairo –with his wife and two kids – to earn his Ph.D. from Al-Azhar university. One of his intentions – as indicating in several of his writings was to have an Indian family educated in a complete Arabic and Islamic culture. During that period, he was tasked by Al-Azhauniversity to teach the principle of Islam in English to Al-Azhar students with the purpose of enabling Arab students to present Islamic principles to English speaking communities. He was also chosen as the editor of the English section of Al-Azhar magazine ( a research magazine published by Al-Azhar university). He was also chosen a member of the examination committee, a member of delegation selection committee to west Asia, member of the Technical Office of AlAzhar University Rector. He is probably one of the very few non-Egyptians who held so many posts in Al-Azhar university. In 1970 he was appointed as the chief editor of ‘Sawthul Hind’ an Arabic magazine published by the Indian Embassy – Cairo. The magazine’s main purpose was to introduce India, its culture and news to the Arab world. 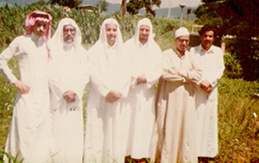 In 1977, he left Cairo and joined the Islamic University in Medina, Saudi Arabia, as a professor in the College of Dawa and the Arabic Language institute. During this period, he participated in several training programs that were conducted in other countries. He traveled to the Philippines, Pakistan and Guinea for that purpose. He also started the English section for the official journal of the Islamic University. In 1984, he travelled to Qatar and joined as the editor of the Islamic section of ‘Al-Khaleej Alyoum’ newspaper. By the end of 1988, he returned to his homeland Kerala, after a gap of over 35 years. The years to come were some of his busiest years in life. He was initially requested to be the director of the Islamic Research and Training Center, in Shantapuram – Kerala. 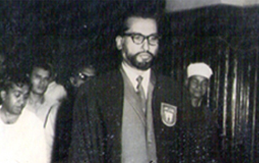 Later this center was converted to full fledged college and named ‘Dawa College’ which specialised in post graduate studies in Islamic studies He was the first principal of Dawa College. As part of his social activities, he was inducted as an advisor of MES (Muslim Educational Society), he chaired forums that gathered Muslim groups under one banner, he participated in several dialogues with various communities. His last achievement, was establishing Azhar-Uloom college near his hometown of Alwaye. This college was dedicated to imparting Islamic knowledge to the newer generation. On July 23rd 1996, this great scholar breathed his last after spending two weeks in hospital on suffering from a heart attack. He was buried the very next day in his own village of Veliyathunad, after a funeral attended by masses never seen before in that small village.